It’s been about a decade from my last visit, but I still fondly remember the Maytag Blue potato chips from J. Gilbert’s steakhouse in Glastonbury. The house-made potato chips topped with a blue cheese sauce are pure genius — reminiscent of orange nacho cheese-smothered tortilla chips, but more elegant, unexpected. They don’t appear on their gluten-free menu, which gave me a big clue that the base of the sauce is a flour-containing bechamel¹ since Maytag Blue cheese is gluten-free. No sweat. Make a gluten-free roux for the sauce using millet flour instead of all-purpose, then whisk in whole milk and melt in a nice wedge of cheese and you’re done. Well, almost. I cheat when it comes to the potatoes. Instead of making chips from scratch, I rely on my favorite kettle-cooked variety — the olive oil potato chips from Trader Joe’s. They only contain three ingredients — potatoes, olive oil and salt — and hold up well to the sauce, maintaing a crisp texture longer than thinner-cut varieties. To give them a straight-from-the-fryer feel, I recommend warming them in the oven for a few minutes before drizzling with the hot cheese sauce. Stacked a couple layers high and finished with a sprinkle of chives this appetizer is a thing of beauty. In a small saucepan (2-quart), combine millet flour and butter (this is your roux); set over medium heat. Whisk mixture as the butter melts to break up lumps. Cook for about 30 seconds once mixture is smooth and reaches a simmer. Slowly whisk cold milk into roux (now you’ve got a béchamel sauce in the works); whisk constantly to prevent sticking and keep it smooth. Bring mixture to a simmer, and continue to cook until the mixture coats the back of a wooden spoon and when you run your finger through it a distinct track remains. Reduce heat to low, crumble in blue cheese and add black pepper; whisk until mixture is smooth. Increase heat to medium and bring mixture to a simmer, whisking often. Continue to simmer until mixture coats the back of a wooden spoon and when you run your finger through it a distinct track remains. Transfer mixture to a heatproof jar (1/2 pint) and set it aside to cool for a few minutes — it’ll develop a bit of a skin on top as it cools, so stir before using. DO AHEAD: Blue cheese sauce may be made several days in advance; cover jar and store in the fridge fridge. Reheat gently over low heat in a small saucepan. To get more of a pourable consistency, whisk in a small amount of extra milk — add a little at a time until the desired consistency is reached. 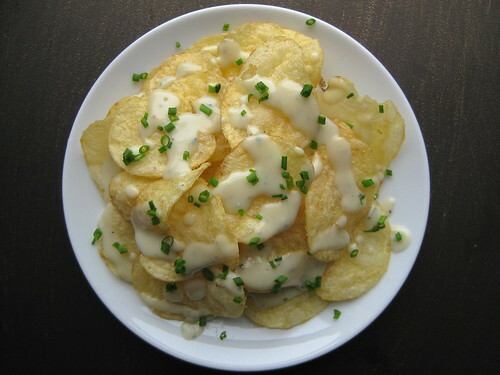 Arrange warmed chips in a single layer (overlapping edges just a bit) on the platter/plate — for every 1 ounce of chips, drizzle 1 tablespoon of blue cheese sauce on top and sprinkle with chives. Add another layer of chips and cheese, using the same ratio above, and another sprinkle of chives. Serve immediately. ¹ And/or they don’t have dedicated potato chip fryers, so the oil gets contaminated with gluten from other fried items (ie onion rings, calamari). Cross-contact is the worst. ² Verified the gluten-free status over the phone; it’s not listed on their website (or if it is I couldn’t find it!). Contact info is available here.